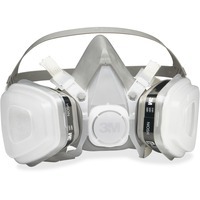 Half facepiece respirator is ideal for intermittent use, such as with spray paint, pesticides, agriculture, construction and transportation. When properly fitted, the NIOSH approved respirator helps provide respiratory protection from certain organic vapors and particulates at concentrations up to 10 times the Permissible Exposure Limit PEL. Do not use in environments that are immediately dangerous to life or health. Low profile design allows greater comfort for use with goggles. Lightweight, disposable respirator is made of thermoplastic elastomer. Filter cartridges are permanently attached.